You would think for a band who started distinctly in the blackthrash field that a switch towards more traditional forms of metal might be a complete left hook, and yet osmehow it isn't. In fact the musical twists and turns of Witching Hour throughout their twelve year career have always been strangely fascinating and a fitting testament to all that hte band has been able to accomplish. Despite having crafted a record though that certainly tips the cap to old school forms of heavy metal the record still is not without its share of black thrash elements. My problem with ...And Silent Grief Shadows The Passing Moon is more that the overall execution feels weak. the solos do not stun and the guitar tone leaves something to be desired. That being said I get the impression that some of this was for effect. 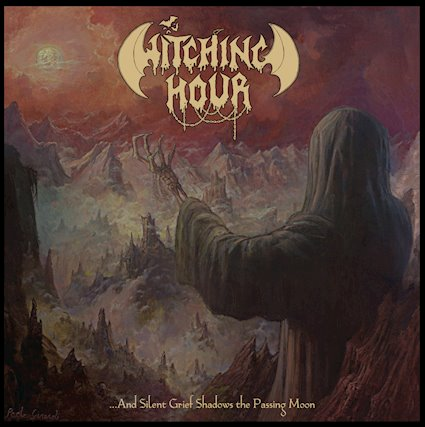 The pure metal magic of Witching Hour seems to thrive best in how atavistic it is and how dedicated it is in its look back to the past. While elements of Manilla Road or Heavy Load are not influences you might expect to see in a German thrash band here we are, this is a group who have managed to evolve their sounds and bring in weird and fascinating new elements to make for some exciting listening. ...And Silent Grief Shadows The Passing Moon is an interesting listen, one that really is not afraid to dedicate itself to metal rearview mirror. While I'm not totally sold on the disparate musical elements used here it definitely does a good job of fusing old traditions with modern more aggressive sounds. Rip roaring and fun, tracks like As I Walk Among Sepulchral Ruins speak to the sort of bloodthirsty inner fifteen year old that allows metal to keep thriving. Crazy, a little bit ridiculous and faster than over the top, Witching Hour know exactly what they want to deliver.